The room where “Adulting 101” is held. If anyone received an email with the subject “Adulting 101 and Free Pizza,” hopefully you did not write it off. It is not a new class to be taken next quarter by freshmen, rather a monthly meeting to educate students maturing in their young adult years. 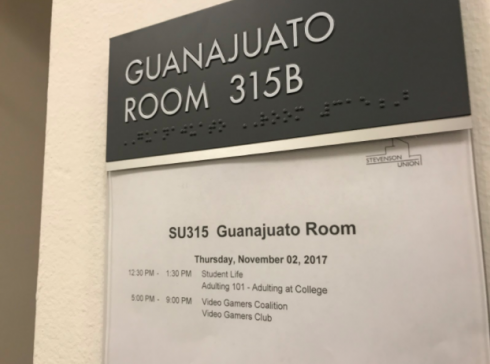 Adulting 101 had its first class on Nov. 2 from 12:30 P.M. to 1:30 P.M. The course was put on by the Event Planning Involving Committee (EPIC) at Southern Oregon University. Danielle Mancuso, Assistant Director of Student Life for the Union and Traditions, is the head of these classes, which will be held once more later in the month. Last year, Mancuso and the entire EPIC team held an event at the Stevenson Union courtyard discussing and interviewing with students on what they wanted to know more about “Adulting.” EPIC heard from over 300 students, ranging from lowerclassmen to upperclassmen. The classes “…could [be beneficial] to any age and any student,” Mancuso said. More classes will be offered on a variety of subjects. Mancuso explained that students are not required to come to every class, nor do they need to RSVP. This first class, “Adulting in College,” covered the nature of stress and how it impacts students in their university years. Matt Vogel is a Health Promotion Specialist and came into speak about how students can handle stress and the steps that they could take to relax. Anxieties that students get can lead to health problems such as weight gain, insomnia, and even mental health issues. Vogel explained to the class that the habits made by students in their college years often carry over to later life and can make their work life more demanding and harder to live with. Sarah Jones, a freshman at SOU explained that the extra help is important and needed. “This kind of stuff isn’t really taught about in schools,” she said. The next class will be held on Tuesday, Nov. 28 from 12:30 P.M. to 1:30 P.M. in the Red Rm at The Hawk. The class will cover “Surviving Winter Break” and will go over the tips that students can use when handling the pain of heading back home for the holidays. Free Pizza will be served again.